The U.S. military and tattoos have an entangled history. The rise of the tattoo in popular culture started with floods of inked veterans -- especially from World War II -- returning home with them. The first tattoo parlor in New York City, established in 1846, served to mark up Civil War soldiers. It is that strong history that's probably the reason why a blog post on the Army's website declared in 2009, "Today, it seems, you couldn't throw a rock into an Army formation without hitting a Soldier with at least one tattoo." So it might be strange for the Army to put forth a new rule banning them on commonly tattooed portions of the body. Current soldiers may be grandfathered in, but all soldiers will still be barred from having any tattoos that are racist, sexist, or extremist. 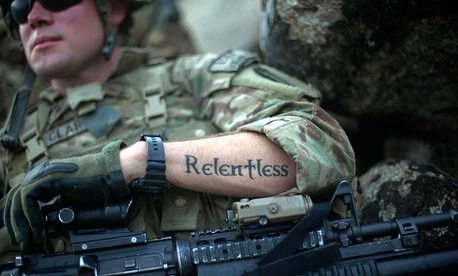 Once the rules are implemented, soldiers will sit down with their unit leaders and "self identify" each tattoo. Soldiers will be required to pay for the removal of any tattoo that violates the policy, [Sgt. Maj. of the Army Raymond Chandler] said. Forcing the removal of offensive tattoos is a step up in severity from current regulations. Currently, "commanders may not order the removal of a tattoo or brand. However, the commander must counsel soldiers, and afford them the opportunity to seek medical advice about removal or alteration of the tattoo or brand." If the soldier does respond to the counsel, the commander is to make sure "the soldier understands the policy." For reference, here's what the Army considers offensive in tattoos. (2) Tattoos or brands that are extremist, indecent, sexist, or racist are prohibited, regardless of location on the body, as they are prejudicial to good order and discipline within units. (a) Extremist tattoos or brands are those affiliated with, depicting, or symbolizing extremist philosophies, organizations, or activities. Extremist philosophies, organizations, and activities are those which advocate racial, gender, or ethnic hatred or intolerance; advocate, create, or engage in illegal discrimination based on race, color, gender, ethnicity, religion, or national origin; or advocate violence or other unlawful means of depriving individual rights under the U.S. Constitution, federal, or state law (see para 4–12, AR 600–20). (b) Indecent tattoos or brands are those that are grossly offensive to modesty, decency, or propriety; shock the moral sense because of their vulgar, filthy, or disgusting nature or tendency to incite lustful thought; or tend reasonably to corrupt morals or incite libidinous thoughts. (c) Sexist tattoos or brands are those that advocate a philosophy that degrades or demeans a person based on gender, but that may not meet the same definition of "indecent." (d) Racist tattoos or brands are those that advocate a philosophy that degrades or demeans a person based on race, ethnicity, or national origin.